Owen and Ocean pose for a photo. There are hundreds of small side roads going through farmers’ fields and forests in the hills north of Minoh. I just love cycling, especially with my children. It is so nice to get them out of the house, off personal digital devices and into the countryside. When you are out cycling, you always see interesting things. We saw a small field of the famous “cosmos” flowers, the autumn “cherry blossoms” of Japan. We also found the British restaurant that is a replica of an old village in England that serves a decent fish’n’chips. Nadia and I went there a couple of years ago but could not find it again. The splashes of orange, yellow and red gave some color to the autumn scenes of rice fields already harvested and gray skies. I took Owen and Ocean with me on a bike ride this afternoon. 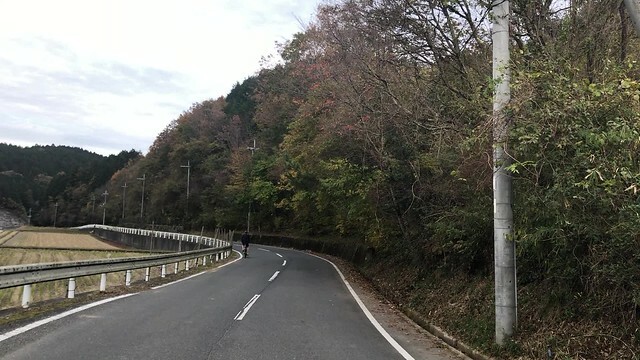 We started in the small town of Toyono and did a decent sized loop through the forests and fields straddling the border of Osaka and Kyoto prefectures. Ocean’s biking ability and stamina impressed me and she did not complain during the ride. My favorite aspect of living in Japan is being able to road cycle relatively safely. Because there are a lot of pedestrians and cyclists, they have the right-of-way, which is opposite in my home country of the USA where cars rule. I think it is part of the reason people are healthier here than in the USA because everyone walks and rides to do their daily errands. I think it was a mistake for American society to make the car “king” and make it almost impossible in many places, to walk or ride to get your daily activities. Things such as zoning laws, lack of bike lanes and sidewalks, low-density housing, etc. have all contributed to this. These topics have been addressed by many before and there is some progress, but America has a long way to go to reach a level citizens being able to move daily for health and reduction of reliance on fossil fuels. I have a long glorious summer to cycle every day and I absolutely love it. It is pure pleasure to ride up and down the rolling hills in the northern Osaka and Kyoto prefectures just outside of our suburb of Minoh. I feel myself getting stronger. Watching the Tour de France also helps get me motivated to get out daily. Using a VPN, we are able to watch the SBS (Special Broadcasting System) coverage. SBS is similar to National Public Radio in the USA except that it is specifically geared to multiculturalism. Their sports programming included the World Cup and Tour de France. There are risks to cycling and I try to be as safe as possible. I try to obey traffic signals, am cautious around intersections and high-traffic areas. I also go much slower than I possibly could downhill and always wear a helmet. Cycling has prolonged by exercise by giving my knees a break. My knees have a lot of running miles on them as I have been active in distance running since my early teens. I can only now run a couple of times a week and cycling has taken the place of running. I ride a Merida road cycle which was a hand-me-down from a departed faculty member. He left it and it sat unused in the parking lot until I took it into a shop to refurbish it and get it road worthy. It may be time to buy a proper cycle with biking shoes and pedals. I am still resisting wearing Lycra shorts and top and going all in on the gear and equipment, but I see the appeal. I read some articles about the MAMIL (Middle-Aged Man in Lycra). The other part of cycling I like is the stress relief it gives me. Going for a ride first thing in the morning or after a day at school is such an uplifting mood-boosting activity. The camaraderie with friends is also great. Kids are back from running with mom. I’ll blog a bit more about cycling later this summer.